Below are some simple step-by-step instructions to help you update your actewagl.net.au email/web address to a new domain name in Account Manager. 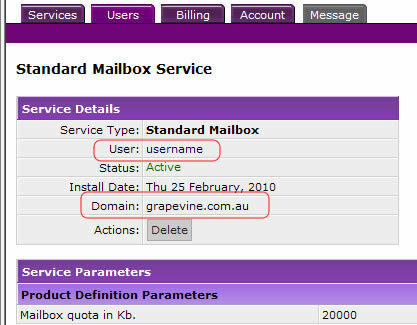 If you experience any problems while trying to update your email/web address, please contact the Grapevine Technical Support team on 13 35 00 (option 3) and they will be happy to help you. 1) Log into Account Manager using your existing actewagl.net.au email address. 2) Once you have logged in, you will see a notification regarding the discontinuation of actewagl.net.au services. Click on the link to update your email/web address. 3) On the next screen, you will be asked to select a new domain name from the drop-down list. Once you have selected a new domain name, click "next". 4) Then simply confirm the change by clicking the "Finish" button. 5) To verify your new email address has been set up correctly, go to the "Users" tab and check the "User" and "Domain" details match the new email address you requested. 6) Remember to update your email client settings if you check and send email from a program on your computer (such as Outlook Express, Thunderbird or Mac Mail). 7) If you use a router, remember to update your login details. Please note that the Grapevine Helpdesk does not provide support for all routers, so refer to your router user manual, if required.